Powervamp’s Sales Director, James Ackland, was recently interviewed for an article on battery powered ground power units for Airside International magazine. The article was part of an in-depth feature profiling all aspects of aviation ground power, particularly the latest developments within environmentally considerate alternatives to diesel generators. Powervamp’s 28 volt DC Coolspool ramp carts are designed to replace diesel GPUs or fixed and semi-mobile transformer rectifier units (TRUs). These large, new generation, powerful, heavy-duty battery carts provide a combination of instant high amperage with pure DC wave form and full mobility, low initial investment and extremely low operating costs. 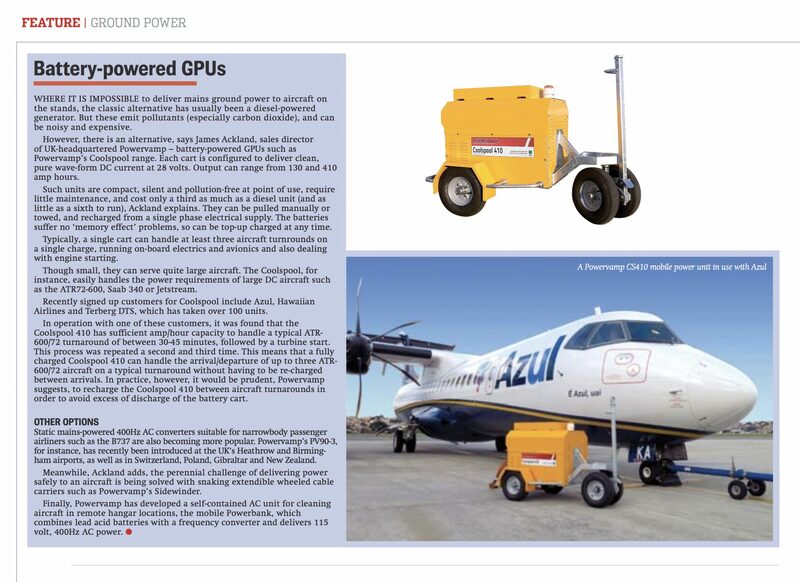 The complete feature can be read here – Airside Ground Power Feature.